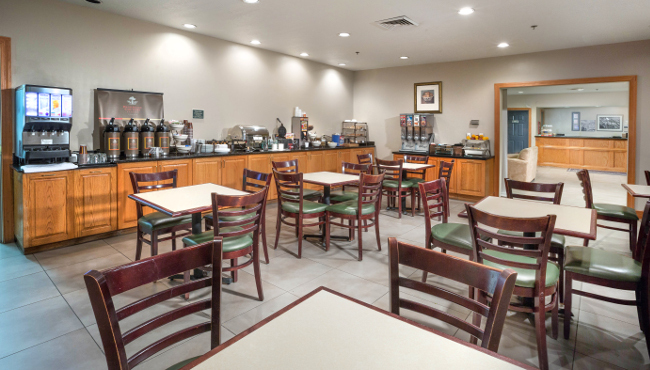 Wake up to the aroma of Belgian waffles, scrambled eggs and biscuits when you stay at the Country Inn & Suites, Augusta at I-20. Each morning at our free, hot breakfast you can find hearty options such as burritos and eggs alongside lighter items like cereals, yogurt, fresh fruit and pastries. Finding lunch and dinner is almost as easy thanks to the variety of restaurants within a short drive. If your time is limited, just ask for a Breakfast to Go, a bagged breakfast complete with a bottled water and a newspaper.